Gosh, there isn't a whole lot to say here, except "wow, Herb Alpert". Herb Alpert, the man who gave the world of game shows cheesy and happy theme music and unconsciously wrote soundtracks to countless surfing and beach-blanket-bimbo flashback movies. Herb Alpert, made infamous at 45 RPMs by '80s punk rockers that grabbed the wrong slice of party vinyl in their rush to get drunk and laid, then again by '90's Midwest scenesters who decorate their apartments with lava lamps, shag carpet and longboards. 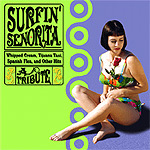 The best of Alpert is represented here, along with the best of the bands united in the cause to Bring Surf Music Back: Sir Finks, Herman the German, Pollo del Mar, and what surf comp would be complete without Satan's Pilgrims? They're here, too. Definitely a must for the Moon Doggy or Surf Betty in your life.